If you got bored at work and googled “Subaru WRX STI” to look at photos of Subarus like, you know, a normal person, you might have been alarmed to see “The Subaru WRX STI is dead” in headlines. It is not dead everywhere. It’s just no longer for sale in the U.K. after this year because the company that imports the car there opted not to carry it anymore. No. The WRX STI is not dead, at least not for all of us. 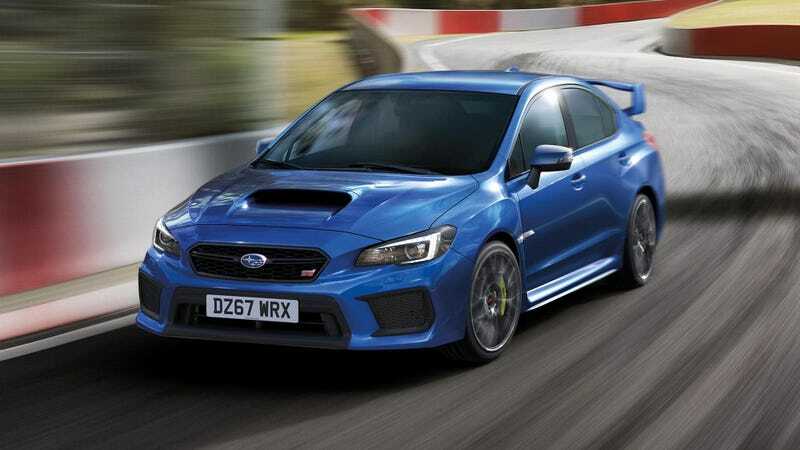 The company that imports Subaru cars into the U.K., IM Group, decided not to bring the WRX STI back to that country for another year. Subaru will let the car say goodbye there with a special edition that, of course, has a higher price tag than a regular WRX STI, along with performance upgrades and “final edition” markings on it. It’s called the WRX STI Final Edition, and only 150 will be made. With the launches of new models, and investment in platform and powertrains going forward, the timing has felt right to open a new chapter for Subaru and allow WRX STI’s heritage to inform future developments rather than being continued. The wheel size has been increased to 19 inches to house new larger Brembo® brakes with yellow painted calipers, which improve fade-resistance and brake performance and a consistent pedal feel when driving on the limit. The front bumper has been redesigned to look more purposeful with the lower grille blacked out with a geometric textured panel, and has a larger opening to enhance cooling performance. ... The Subaru wing design which flows through to the C-shaped headlights has been incorporated, hinting at the Boxer engine under the bonnet. A Final Edition badge is positioned on the door. Inside, high gloss black inserts are added to the instrument panel, gear stick surround, door panels and steering wheel with red stitching and red seatbelts fitted to tie the scheme together. But for now, the car is safe outside of the U.K. and the STI badge is alive, well and potentially overrated elsewhere: Subaru just made a slightly tuned BRZ STI for the Japanese market, and it’s exciting enough to make you yawn.